ONE OF OUR TOP (5) SELLING BOOKS. WORTH THE PURCHASE PRICE AT DOUBLE THE PRICE. 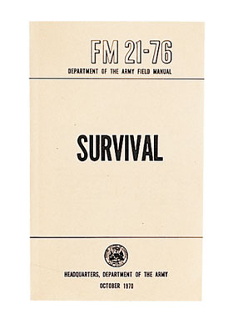 GENERAL INTRODUCTION AND INDIVIDUAL AND GROUP SURVIVAL ORIENTATION, NAVIGATION, FINDING WATER IN ALL PARTS OF THE GLOBE. HOW TO OBTAIN FOOD, START A FIRE AND MUCH MORE.